For the past 20 years Dennis has lived on a farm in southern Ontario with a menagerie of dogs, horses, cats, chickens and other assorted critters. His property is managed for dog training with two ponds, hay fields and wild fields. Here and off property, he pursues his other hobbies and interests which include photography, hunting, fly-fishing and natural history study. Dennis has traveled to all four corners of North America with his retrievers to train, trial, judge, hunt and fish. Dennis judges on both sides of the border, including two Nationals. Dennis occasionally gives training and judging workshops, sometimes with top professionals. As an amateur trainer for almost five decades, Dennis has made 9 Field Trial Champions and 3 National Field Trial Champions. 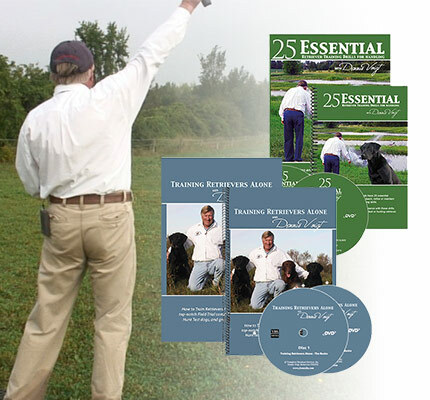 With his DVD programs he shares the training methods he has learned from his own experience as well as the methods of many of the top professional retriever trainers in both the U.S. and Canada. Dennis, with Fiona McKay, author and publish training articles for retriever training on their very popular website RetrieversOnline.